NICSSA Archery Club was founded in 1985. It is primarily a Target Archery Club (though a number of members regularly take part in Field Archery competitions) and is open to everyone, both Civil Servants and the general public. 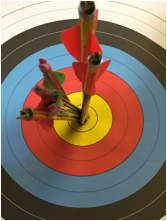 Archery is an all year round activity, dividing into an indoor season (September to March) and an outdoor season (April to September). Archery consists of two principal disciplines; Target Archery, which is an Olympic sport and takes place on level ground over marked distances; and Field Archery, which takes place on varying ground (uphill, down vale and through woodland) and over marked or unmarked distances. Recurve or Freestyle (the Olympic / FITA discipline), Compound (featured at the World Games), Barebow and the Traditional Longbow. Each style competes separately and sometimes at different levels (classes), depending on skill. As well as catering to the established archer, the club has facilities for beginners. Equipment and coaching is available to assist the learning process and make it FUN! 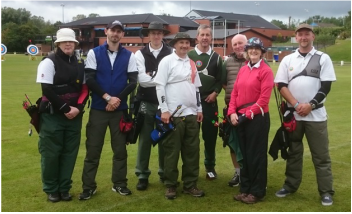 In order to bring archery to the wider public and recruit new members, the club provides "Have-A-Go" sessions at a few events during the Summer. The emphasis is on allowing individuals to try the sport and to ask questions. Check out our E﻿vents page for the next opportunity to try i﻿t out! The Club is affiliated to the Archery Northern Ireland (ANI), Archery GB (and through them to the International Archery Federation - FITA), the Civil Service Archery Association (CSAA) and NICSSA.